The Federal Government on Monday announced that it has completed the Mausoleum of first President of Nigeria, Dr. Nnamdi Azikiwe in Onitsha, Anambra, 21 years after its commencement. Mr. Babatunde Fashola, the Minister of Works, Power and Housing made the disclosure when he inspected the project at Onitsha, the country home of Azikiwe. “During the build-up to 2015 general elections, President Muhammad Buhari made a commitment that he would complete Azikiwe’s mausoleum, today Mr. President has kept his words and we are happy,” he said. Fashola said though equipment of the monument was yet to be accomplished, the federal government would before long do the furnishing. The Minister of Labour and Productivity, Dr. Ngige who also spoke, described the completion of the Mausoleum as a sign of `Mr. President’s open and fair leadership style’. “As a South East son, I am happy that this project for the memory of our late father and son was finally completed, it is a big honor done to our people by Mr. President,” he said. Ngige listed other ongoing projects under the present administration in the zone to include the second Niger Bridge, Enugu/Onitsha highway. 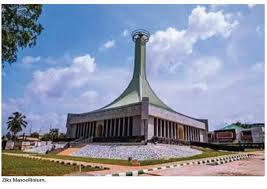 The News Agency of Nigeria recalls that Azikiwe’s Mausoleum started by the Federal Government in 1997 was abandoned till the president administration completed the project. NAN reports that the two-story mausoleum with provisions for two conference halls, museum/archive, video, research, library and documents. Fashola later visited the Federal Secretariat, Awka and promised that the project started since the creation of Anambra State more than 21 years ago would be delivered before May next year. He noted that delay in completing the work before now was due to endemic corruption in the system, adding that with the coming of Buhari’s government and fight against corruption, we are seeing a positive improvement.